With no restrictions on design, the Quantum cruising Code 0 is created to be a very forgiving sail, perfect for light air on close angles upwind, at very broad angles in heavier breeze, and all the angles in between. The Quantum Code 0 for cruising monohull sailboats is a full sail, shaped like an asymmetrical spinnaker, and furls easily on a top-down furling system. 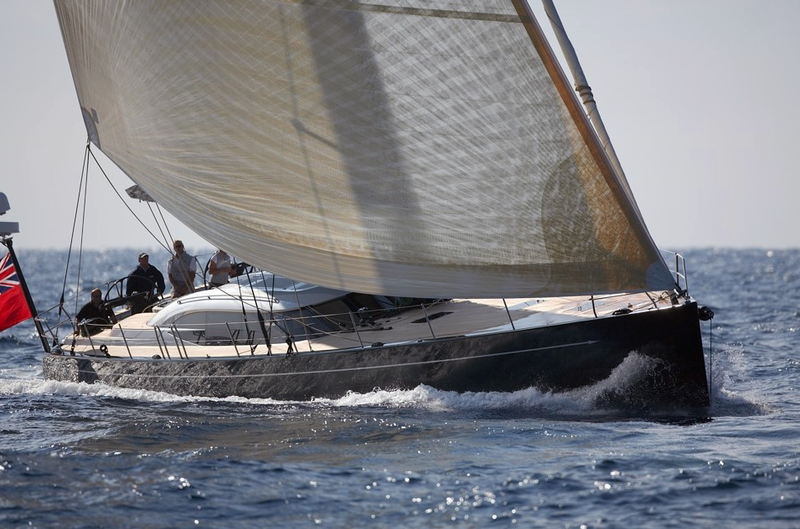 While the midgirth of the racing Code 0 is restricted to at least 75% of the foot length, the cruising version of the sail has no restrictions, giving the sailmaker a lot of leeway in design. “You can make the midgirth anywhere from 55% to 75% of the foot length, allowing you to make them very deep and very flat,” says Quantum’s VP of Product Integration and sail designer Doug Stewart. Many cruisers are intimidated by downwind sails, especially when sailing shorthanded or with inexperienced guests. The Code 0 is perfect for cruising boats because it is easily deployed on its furler and has a UV strip to protect it during a whole weekend or several days of use so that it doesn’t have to be taken down. “We find people will use this headsail more than any other on their boat,” says Stewart. The sail can be used at relatively tight angles in light air, and at very broad angles in heavier air. “It will take you through more wind angles than any other sail on the boat. Your kite is for downwind, your genoa is for upwind; the Code 0 is for all the angles in between,” Stewart says. Now he says, he uses the sail on his Beneteau Oceanis 46 Spirit with clients and with his crew, on everything from short day trips to long-distance singlehanded racing—even the Rolex Fastnet race. He also carries a Quantum Vision Code 3 for downwind sailing with a full crew, but says the Code 0 is easier to use when sailing short- or singlehanded. “Since the sail is a little smaller and flatter than the V3, it’s a perfect sail for shorthanded sailing, even in stronger winds. It is better on the helm and easier to furl away,” says Greven. While the cruising Code 0 is designed with a protective UV cover, that cover is still very light. It will easily survive several days of use, but if you won’t be on the boat for a week or more, take the sail down, put it in its bag, and store it down below. Also, as with any sail furled on a torsional rope, if a storm blows through, there’s nothing to stop the sail from opening up. So if inclement weather is approaching, get the sail off the deck. Greven would be the first to recommend the Code 0 to other cruisers, but says the sail sells itself. So while choosing a new sail for your inventory depends largely on what kind of sailing you want to optimize for, be sure to check out the Code 0. The versatility of the sail, combined with ease of use may very well prove to be the next best sail on your list. “You can make the midgirth anywhere from 55% to 75% of the foot length, allowing you to make them very deep and very flat,” says Quantum’s VP of Product Integration and sail designer Doug Stewart. Do you an article that explains this? I'm preparing my boat for some extended voyaging and have never been happy with light air performance. I want to understand it better so I know what to ask for. PS my spinnaker gets over powered at 18kts so I'm digging the 18 to 24 aspect you talked about!